Dry-toast the ancho chillies and fennel and sesame seeds in a large casserole (or heavy-based saucepan) for 1-2 minutes, until fragrant. Transfer the chillies to a bowl and cover with just-boiled water; set aside for 15-20 minutes, until softened. Grind the sesame and fenne seeds to a powder in a pestle and mortar (or spice grinder) with a little salt. Whizz in a small food processor with the chillies and 4 tbsp of their soaking liquid, plus the sugar, chopped garlic, tomatoes and the citrus zests and juices to make a thick paste; season. 15-20 minutes); remove and set aside. Add the onions and cook, covered, for 10 minutes, until softened. Scrape the base of the pan to lift any sticky bits, then stir in the crushed garlic, bay leaves and coriander stalks. Cook for another 3-5 minutes, then return the pork to the pan with the spice paste and 100ml water. Bring to the boil, then cover with foil and a lid. Transfer to the oven for 2-3 hours, until the meat is tender. Turn the oven up to 220°C, gas mark 7, uncover the dish and cook for another 20-25 minutes, until the sauce has thickened. Rest, partially covered, for 10-15 minutes before shredding the pork with two forks. Stir through most of the coriander and oregano leaves; keep warm. Just before serving, mash the avocados in a bowl. Gently stir in the remaining salsa ingredients; season. 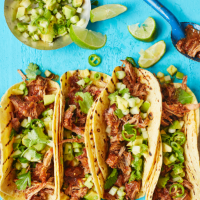 Serve the pork in warm tortillas, with the salsa alongside. Scatter everything with the remaining herbs and offer extra lime wedges for squeezing.